In Xcode 4 and 5 you could test your user interface in Interface Builder by choosing Editor > Simulate Document. 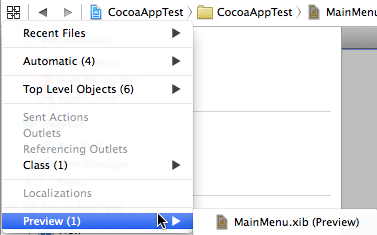 Apple removed the Simulate Document menu item in Xcode 6. The workaround is to use the assistant editor. After switching to the assistant editor, click the navigation button in the jump bar, which is to the left of the back and forward buttons. Choose Preview and choose the xib or storyboard file to preview the file in the assistant editor. I should note that I couldn’t get the preview to show up in the assistant editor. If you have the same problem, I don’t have an answer for you. For more information read the section “Previewing Your Layout for Different Localizations, iOS Devices, and iOS Versions” in Apple’s Interface Builder Help document, which you can read in Xcode. I figured out how to get the preview to appear. You must open the xib or storyboard file in both assistant editors. Click the navigation button in the second editor (either the bottom or the right editor, depending on how you stack the assistant editors) and choose Preview to get the preview to appear. If you’re using a storyboard for a Mac application, you can preview different parts of your interface by selecting the appropriate controller in the first editor (either the top or the left editor, depending on how you stack the assistant editors). Selecting the Application item in the application scene previews the menu bar. Selecting a window controller previews the window. Selecting a view controller previews the view. Thank you for this info. Very useful.